CarGurus has 22,946 nationwide MAZDA3 listings starting at $999. No matter the driving situation, whether you’re inching along in traffic or flinging the car down a favorite back road, the 2014 Mazda 3 demonstrates astonishing dynamic competence. 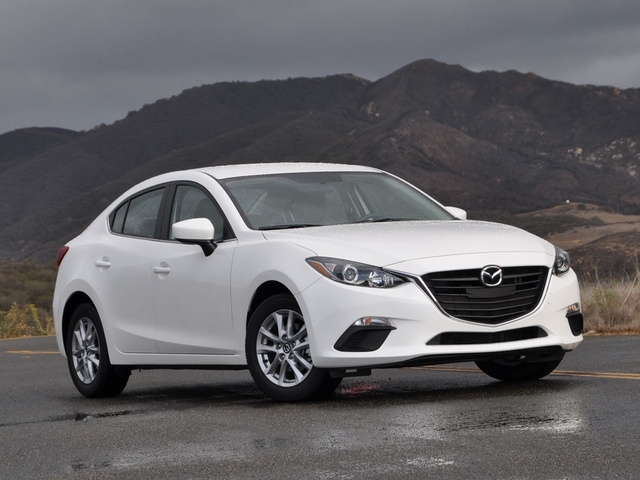 If you like the way the redesigned 2014 Mazda 3 looks, you’re going to love the way it drives. Aside from the car’s confining and uncomfortable back seat, there’s little to criticize about this car. Better yet, Mazda offers plenty of variety in terms of body styles, powertrains and equipment, letting a buyer choose anything from a bare-bones basic model to a leather-lined and technology-laden masterpiece of a compact car. Wrapped in Mazda’s latest design language, the redesigned 2014 Mazda 3 is sold in 4-door sedan and 5-door hatchback formats, with an “i” or an “s” designation depending on the engine choice, accompanied by SV, Sport, Touring or Grand Touring trims and equipped with a manual or automatic transmission. The result is a veritable blizzard of choice, with prices ranging from a low of $17,750 for a Mazda 3i Sport sedan with a manual gearbox to more than $31,000 with every option added to a Mazda 3s Grand Touring 5-Door. In the Mazda 3i lineup, the Touring trim adds aluminum wheels, heated side mirrors, keyless passive entry with push-button start, a Rear Cross Traffic Alert system, a Blind Spot Monitoring system and nicer trim inside and out. Choosing a Touring model is also a prerequisite to access many of the Mazda 3’s optional upgrades, including dual-zone automatic climate control, a power sunroof, a reversing camera, a navigation system and a Bose premium Surround Sound audio system with HD Radio and Mazda Connect smartphone integration. Mazda Connect includes text-messaging capability, E911 Automatic Emergency Notification service and the ability to access Aha, Pandora and Stitcher Internet radio through the 7-inch touchscreen display. The top-of-the-line Mazda 3i Grand Touring models include all of these features plus leatherette upholstery, a power driver’s seat and heated front seats. More powerful and less fuel-efficient than the Mazda 3i models, Mazda 3s models have more robust brakes, bigger wheel/tire combinations, and a standard automatic transmission. Additionally, all Mazda 3s models include bi-Xenon headlights, LED running lights and taillights, fog lights, unique instrumentation with an Active Driving Display, dual-zone automatic climate control, a Bose premium audio system and the Mazda Connect system described above. Add Grand Touring trim to the Mazda 3s, and the car is equipped with genuine perforated leather seats, a power sunroof, automatic headlights, an Adaptive Front Lighting System, rain-sensing wipers and more. Exclusive options for this model include active grille shutters, a fuel-saving i-ELOOP regenerative braking system, automatic high-beam headlights, a Lane Departure Warning System and Smart City Brake Support. Once you’ve selected a body style and a trim level, additional options are available, including extra-cost paint, rear parking assist sensors, remote engine start, cargo protection and organization features, gunmetal-finish wheels and more. Aside from its Snowflake White Pearl paint job, my Mazda 3i Touring Sedan test car didn’t have any of these extras. It did have an automatic transmission and a Technology Package (dual-zone climate control, Bose audio, navigation and Mazda Connect smartphone integration), bringing the window sticker to $23,240. Had my sample been a 5-Door model, it would have cost an extra $500. 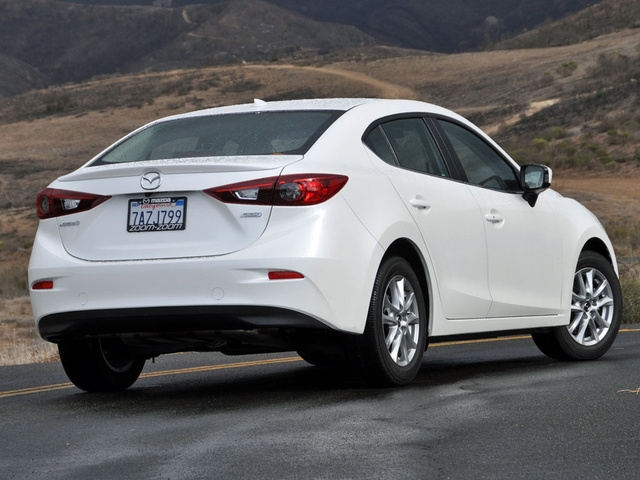 If you’re a fan of recent Mazda designs, then you probably like the way the new 2014 Mazda 3 looks. I know my neighbors did. 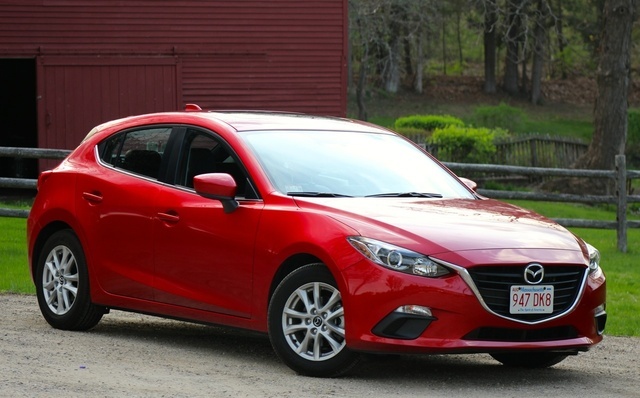 They see lots of test cars parked in my driveway, but when the Mazda 3 was sitting there, I overheard them remarking on how appealing the design is as they passed by on their twice-daily dog-walking excursions. Personally, I think the Mazda 3 is quite appealing, especially with the 18-inch wheels that come standard on the Mazda 3s. Still, as has been the case with every Mazda 3 ever built, this new one looks a little funny from certain angles. It displays cab-rearward proportions, an effect magnified by oversized front styling elements, converging body lines at the rear doors, tiny rear door glass, a super-short rear deck, and plenty of visual mass sitting over the rear axle. The undersized 16-inch wheels included for all Mazda 3i models certainly don’t help, and they’re a complete PITA to clean. It’s really too bad Mazda reserves the nicer 18-inch wheels for the Mazda 3s. Nevertheless, the new Mazda 3 possesses undeniable style, something frequently lacking from modern small car design. And it is style that my neighbors noticed as they walked their dogs by the house. If the car’s exterior looks a little wonky from certain angles, there’s no mistaking the interior for anything but a near-perfect example of quality and design. From materials to gloss and grain, the Mazda 3i Touring’s cabin impresses from a look-and-feel standpoint. For example, the driver’s door panel is soft from the glass to the armrest, which means that no matter where you come into contact with it, there’s a soft spot for your elbow to rest. The single-piece dashboard is almost plush to the touch, and is black even in cars with a Sand-color interior, which gives the Mazda 3 an upscale two-tone appearance while simultaneously reducing glare and reflections. 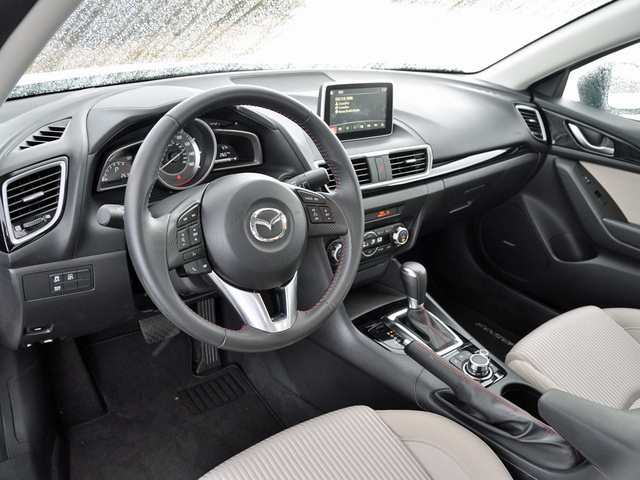 Tasteful metallic accents and gloss black trim panels definitely help to make the Mazda 3 seem more expensive than it is, and while the car’s headliner could be a little nicer, that observation amounts to little more than nitpicking. Clearly, Mazda knows how important a great driving environment is to long-term owner satisfaction. Mazda, more than other Japanese car brands, markets itself as a builder of vehicles that are fun and engaging to drive. To ensure that the company’s “zoom-zoom” brand identity is a credible one, the new Mazda 3 offers a choice between two zippy engines that deliver excellent fuel economy. The more affordable Mazda 3i trims are equipped with the automaker’s 2.0-liter 4-cylinder engine, which makes 155 horsepower at 6,000 rpm and 150 lb-ft of torque at 4,000 rpm and is available with a 6-speed manual gearbox or a 6-speed automatic transmission. 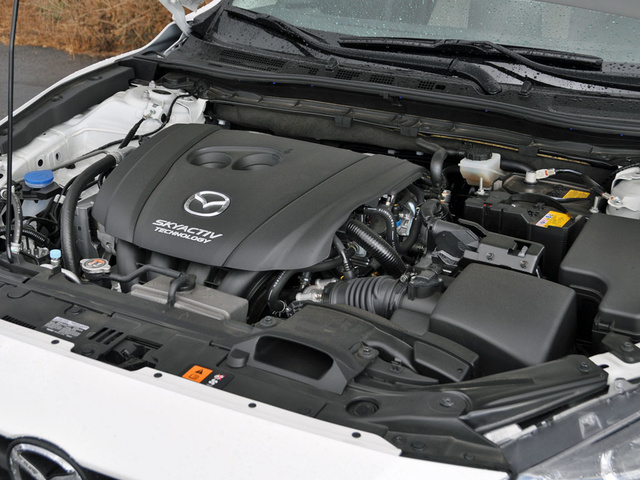 A more powerful 2.5-liter 4-cylinder engine is standard in the Mazda 3s models, delivering 184 hp at 5,700 rpm and 185 lb-ft of torque at 3,250 rpm. A 6-speed automatic transmission is standard with the larger, more powerful powerplant and includes both paddle shifters and a Sport driving mode. Regardless of powertrain choice, the Mazda 3 Sedan is rated to get between 32 and 34 mpg in combined driving, while the Mazda 3 5-Door is expected to return between 31 and 33 mpg. Given how fun the Mazda 3i is to drive, perhaps it’s not a surprise that I averaged 30.2 mpg, well off my test car’s 34-mpg combined-driving EPA rating. The price premium for the more powerful engine amounts to $5,000, and while that includes a number of other upgrades, if you’re thinking about spending that kind of cash just to get 29 hp and 35 lb-ft of torque, forget it. It’s not worth it. Stick with the Mazda 3i and spend the extra money on a decent set of wheels and tires. I say this because my Mazda 3i felt sprightly enough, whether accelerating away from a stop or when punching it to pass slower traffic. Better yet, the engine is smooth, refined and quiet when cruising, characteristics amplified by its traditional automatic transmission instead of a whining continuously variable transmission or hesitant automated manual gearbox. Left in automatic mode, the expertly calibrated transmission knows exactly which gear the driver needs at all times. Driven with enthusiasm on my mountainous test loop, the transmission held revs as I flung the car from corner to corner. Later, climbing the Camarillo Grade from sea level to 1,000 feet in mere miles, the Mazda 3i effortlessly flew up the hill at 80 mph. Unfortunately, the automatic’s manual shift gate employs a counter-intuitive shift pattern, and there are no shift paddles to serve as an alternative. Good thing the transmission doesn’t require driver intervention to perform at its best. Suspension tuning is a model of perfection. This car soaks up minor road irregularities as if they don’t exist and successfully isolates larger ones from the cabin without any loss of body roll control or athleticism. These qualities do not, however, come at the expense of communication, which makes the Mazda 3 one of those rare, genuinely tossable cars that begs to be flogged harder than the driver’s brain believes is prudent. The sophisticated brakes are impressive, too, working flawlessly regardless of the situation. Equipped with ventilated front and solid rear discs, the components make it easy for a driver to finesse the pedal in order to add or reduce the amount of braking, and to bring the car to a smooth, drama-free stop. Plus, if you rapidly move your foot from the brake pedal to the accelerator, the pedal doesn’t clunk up in an unrefined manner. Now that represents attention to detail. If there’s room for dynamic improvement, the electric steering needs just a little bit more attention. Around town, it’s a model of perfection aside from a slight hint of torque wiggle here and there. The faster you go and the curvier the road gets, the less satisfying the steering becomes, feeling leaden and numb at the same time that it proves quick to respond off-center. The fact that the Mazda 3 otherwise suffers not a single dynamic flaw only serves to magnify this one. Still, in spite of my complaint about the car’s steering, the new Mazda 3 is an ultra-refined, exceptionally engineered automobile endowed with mechanical components that rarely call attention to themselves except to flabbergast the driver with their sheer dynamic brilliance. While sitting in traffic, I had plenty of time to assess the Mazda 3’s interior. The driver’s seat is very comfortable and supportive, the leather-wrapped and tilt/telescopic steering wheel is a pleasure to hold, and this car is quiet inside. At highway speed, some tire sizzle enters the cabin, but most of the time the Mazda 3’s interior suffers little in terms of noise, vibration and harshness. Controls exhibit solidity, refinement and logical placement, and I found the car’s analog gauges easy to read. Depending on the angle of the sun and the time of day, however, sunlight and reflections tend to wash out the digital gauge and climate-control displays. Nevertheless, the Mazda 3 is quite the model of logic and simplicity, and the new Mazda Connect system might set new standards in terms of full-featured functionality. I like it just as much as the Uconnect 8.4 system available in the Dodge Dart and the MyLink system offered in the Chevy Sonic. If I have to criticize anything, it’s the amount of rear seat space Mazda provides in this car. Comparatively speaking, a Nissan Sentra or a Toyota Corolla is like a little limousine. Plus, the Mazda’s rear-seat occupants don’t get the soft upper door panels or armrests supplied to the front-seat occupants. The bottom seat cushion sits too low in the car to deliver the kind of thigh support required by grown-ups, and legroom is limited when taller people are riding in front. At least Mazda fully pads the front seatbacks so that they are kind to knees and shins. On a positive note, the Mazda 3 gives buyers seeking extra utility the option of choosing a 5-door hatchback model. Sedans offer 12.4 cubic feet of cargo space, which can be expanded by folding the 60/40-split rear seatbacks. The 5-Door delivers 20.2 cubic feet of space behind the rear seat, more than any midsize sedan, and with the rear seats folded down this version of the Mazda 3 can swallow 47.1 cubes of cargo. There’s no denying that Mazda packs an impressive level of technology into this new compact car, even if you do need to pay extra for it by selecting a higher trim level or adding a pricey option package. From simple things like text-to-voice messaging capability and E911 emergency service to unusual features such as Smart City Brake Support and i-ELOOP regenerative braking, the latter of which captures kinetic energy to power electrical components, the 2014 Mazda 3 offers a surprisingly sophisticated level of entertainment, information, safety and mechanical technologies. The new Mazda 3 is also the first model to receive the automaker’s new Mazda Connect infotainment system. Combining a freestanding touchscreen display, which resembles a tablet computer, and a rotary control dial mounted to the center console and surrounded by primary function buttons, a clear derivation of BMW’s iDrive system, Mazda Connect is an impressive piece of technology for a compact-priced car, constructed of quality bits and pieces to give it an Apple-style look and feel. Note, however, that the touch-sensitive icons on the screen are turned off once the car starts rolling, forcing the driver to use the iDrive-style controls in the center console to operate the Mazda Connect system. While I would prefer that this were not the case, I can understand why Mazda wants to try to limit distraction. Steering-wheel-mounted buttons allow the driver to adjust volume and cycle through radio station pre-sets, and a mute function is available by pressing the small volume knob next to the main Mazda Connect controller on the center console. Also note that Mazda Connect supplies mobile Wi-Fi access, as well as settings that warn the driver when he or she is speeding or approaching an area where speed cameras are in use. Bless you, Mazda, for always looking out for those of us who love to drive, and now not just in terms of driving dynamics. 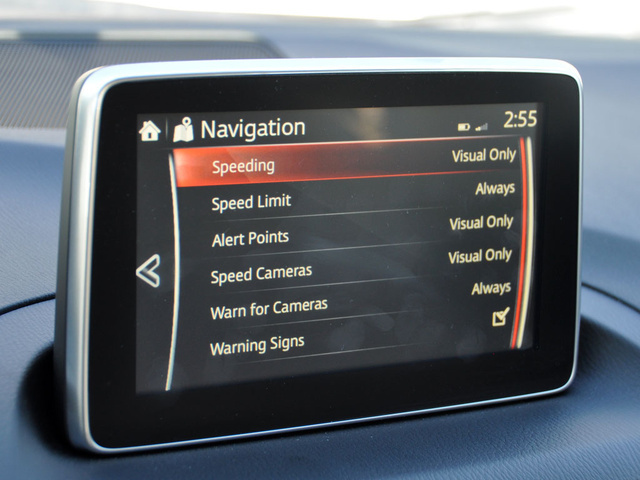 Many of the 2014 Mazda 3’s optional tech systems are related to safety. Rear parking assist sensors are offered for any model. Choose the 3i Touring model, and the car is equipped with both a Blind Spot Monitoring system and a Rear Cross Traffic Alert system. The 3i Grand Touring model adds a reversing camera and E911 Automatic Emergency Notification service. This system helps to speed emergency rescue personnel to the car’s exact location following an airbag deployment. Mazda 3s Touring models include all these features, while the 3s Grand Touring adds rain-sensing wipers and an Adaptive Front Lighting System. Safety-related options for the 3i Touring models include a reversing camera and E911 service. Lane Departure Warning and Smart City Brake Support (SCBS) are offered only for the Mazda 3s Grand Touring models. 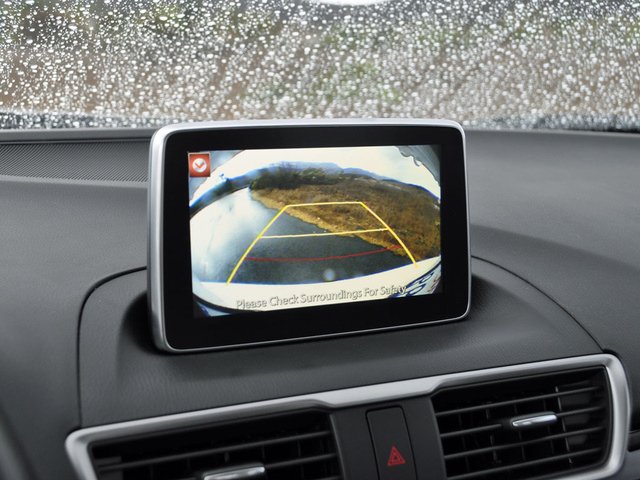 The SCBS is designed to identify potential low-speed collisions and, if necessary, automatically brake the car to avoid them or to lessen damage. As this review is written, neither the National Highway Traffic Safety Administration (NHTSA) nor the Insurance Institute for Highway Safety (IIHS) has performed crash tests on the redesigned 2014 Mazda 3. Although I missed the Mazda 3i Sedan’s official combined-driving fuel economy rating by a significant margin, I am certain that part of the reason is because I drove the car with enthusiasm, and that the other part of the reason is that I spent most of the miles covered traveling city streets and mountain highways. Owners are certain to easily extract better than 30 mpg out of this car, if not more. In terms of other value-related questions, the new 2014 Mazda 3 is likely to perform well if the previous-generation model is any indication. For instance, in recent years, the Mazda 3 has received the highest possible rating for reliability from Consumer Reports. Though J.D. Power’s reliability predictions aren’t quite as rosy, the market research firm thinks the car will deliver better-than-average reliability over time. A Mazda 3 is expected to hold its value over time, too. The previous version of the car enjoyed a 4-star depreciation rating from ALG, and according to Cars.com, the old Mazda 3 model boasted a 4-star long-term cost of ownership rating. As a result, the new car is likely to cost little in terms of ownership, especially because it will still be worth a good chunk of change after you’ve made the last payment. There are, however, no deals to be had on the new Mazda 3. At least not right now, as this review is written, and while dealers are still clearing inventory of the old model. 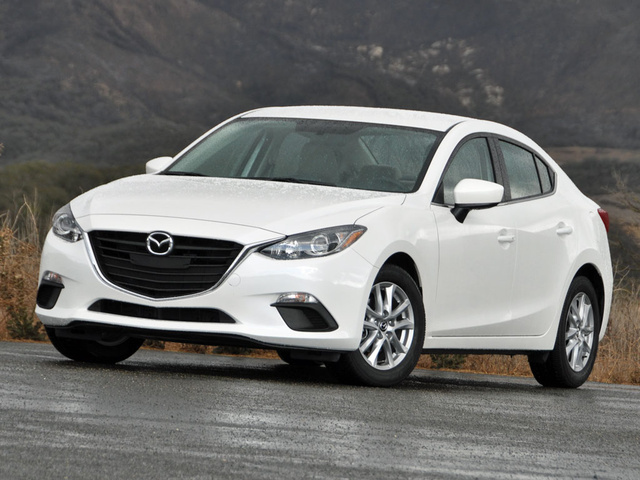 What's your take on the 2014 Mazda MAZDA3? Steve Why oh why did they ruin the looks of an otherwise great looking car by forcing you to put the front license plate in the center of the grill? It makes it appear to have a big buck tooth. I want one of these so bad but every time I see one, I can't get past that. Berniebabe Did you drive the car for 20 minutes or more? Did you find the extreme forward-tilting headrests, the concave seats, or the low height of the passenger seats astoundingly uncomfortable? Monika Ich fahre jetzt seit 6 Monaten und 11.000km. Die Sitzposition ist extrem unbequem. zu konkav. Armlehnen kann man nicht richtig nutzen. Lenkrad, Sitz und Pedale passen von den Abständen her nicht zusammen. Habe 120 Ps Benzin und verbrauche 7 Liter auf 100 km. Users ranked 2014 Mazda MAZDA3 against other cars which they drove/owned. Each ranking was based on 9 categories. Here is the summary of top rankings. Have you driven a 2014 Mazda MAZDA3? Should it take a week for the car dealer to order a replacement battery for my 2014 Mazda 3 grand touring 4 door car?